When adapting an open textbook (or other OER), you may want to incorporate other people’s works into your adaptation. In order to do that, you must ensure that any existing licenses on the work you’re adapting or including are compatible with each other. For example, as explained in Chapter 9, the CC BY license is the least restrictive and is compatible with all of the other CC licenses. However, if you want to include a work that has a CC BY-SA license, you must use that same license with your adaptation (which may conflict with other licenses already attached to the work). 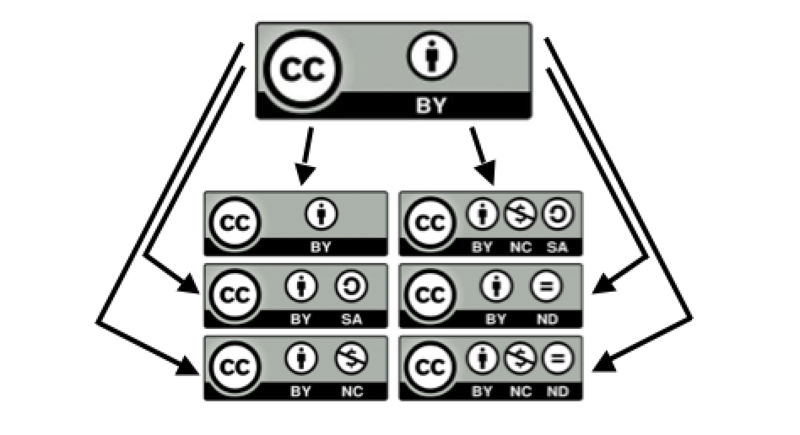 Creative Commons provides more information about CC BY-SA license compatibility on this page. The Orange Grove repository’s video below further explains how CC licenses can be combined. For further help, you can use the use the Creative Commons Choose a License tool or the Wiki/cc license compatibility chart, or contact your institution’s Library or Teaching & Learning Centre. The Creative Commons license definitions and images listed on this page have been copied from Creative Commons and are used under a CC BY 4.0 license. Combining CC Licenses by Shannon Moist is licensed under a Creative Commons Attribution 4.0 International License, except where otherwise noted.